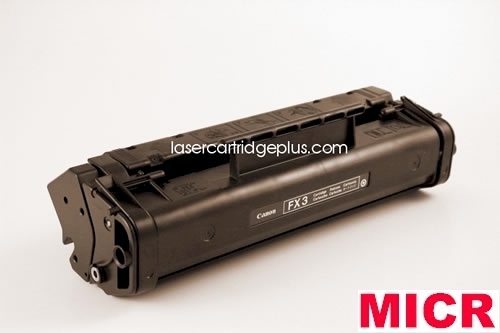 Canon FX3 MICR Cartridge - Canon FX3 MICR Toner Cartridge - This Canon L80 MICR toner is a compatible FX3 MICR cartridge used for check printing. For use in Canon CFX-L3500 IF, CFX-L4000, CFX-L4500 IF, Fax L200, L220, L240, L250, L260 L260i, L280, L290, L300, L350, L360, Faxphone L75, L80, ImageCLASS 1100, LaserCLASS 1060P, 2050, 2060, L300, L4000, MultiPASS L60, L6000, L90 laser printers. Sign up and stay informed on Sales, Special Offers, and get Special Discounts. Click here to subscribe.